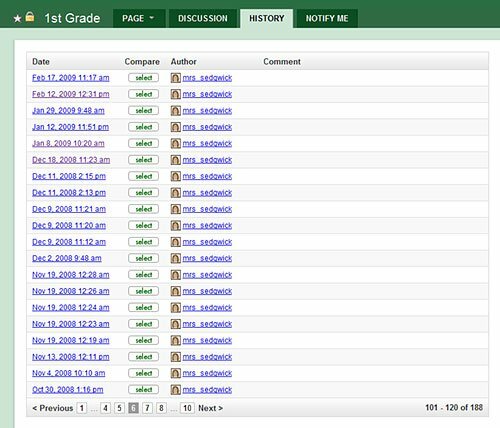 I have been using Wikispaces as my online Computer Lab for the past two years. Prior to that, I had a website that I manually maintained and updated from home. I made the switch so I could easily update the information for my classes whether I was at home or at school or wherever I am as long as I have access to the Internet. I could have switched the computer lab site to a blog or to Weebly or to some other online site creator but I chose to go with a wiki for a variety of reasons. One of the main reasons was that I wanted to have some of my students create content for the wiki at times and it’s easy to do this with Wikispaces since I can set up student login information without my students needing to have email addresses. I recently was reminded of another advantage of using a wiki and it again made me happy that I had made this choice. I was working on lesson plans and knew that I had done the same type of lesson last year and had found and used some web sites that would be great again this year. I checked my Delicious links but couldn’t find what I needed (I really need to tag things better in my links but that’s the subject of a whole different post) and I checked my Google Document from last year’s lesson plans and I hadn’t listed the sites there either. Then came the AHA! moment – I had used a wiki! I knew I had done the lesson about the same time last year, so using the History Tab on the wiki page for the grade in question, I just went back in time and found just what I was looking for. Hooray, I had the information I needed without having to try to search for the sites again. I’m a big fan of not re-inventing the wheel and Wikispaces helped me to not have to!